“We are launching an innovative ballast water treatment solution specifically for the shipping industry, especially for difficult to fit vessels." To reduce emissions with increasing cargo volumes, POLA had to reduce the average emissions per container. POLA reduced the average emissions per container of cargo all eight pollutants. Greenhouse gases were down 30 percent per container on average since 2005 at POLA. Emissions of nitrogen oxides (NOx), a key component of smog, are down an unprecedented 60 percent compared to 2005 emissions levels, their lowest level to date. The 2017 Inventory of Air Emissions released by the Port of Los Angeles shows it set new record lows for emissions reductions while its container volume reached an all-time high of 9.34 million TEUs. Overall, the 2017 findings show the port has maintained or exceeded the dramatic clean air progress it has made over the last 12 years, and has now met all of its 2023 Clean Air Action Plan (CAAP) goals. Diesel particulate matter (DPM) remains down 87 percent, and sulfur oxides (SOx) remain down 98 percent. Based solely on tonnage, though, GHGs are down only 13 percent, which is a result of the substantial increase in activity in 2017 leading to the record cargo volumes. The port’s best year for reducing tons of GHGs was 2013 when GHG emissions were down 23 percent, a year when TEU volume was still down from its pre-recession peak. Ongoing turnover of the truck fleet and upgrades of cargo handling equipment with the cleanest available engines also helped hold the line on emissions. More than half of nearly 17,000 drayage trucks calling at the Port in 2017 have 2010 model year or newer engines. Nearly 47 percent of cargo handling equipment – including cranes, tractors and forklifts – have Tier 4 or equivalent diesel engines, the cleanest diesel emission technology on the market. The latest findings are based on data collected during calendar year 2017 and reviewed by regional, state and federal air regulatory agencies. 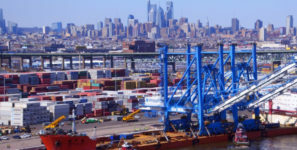 The annual inventory details the impact of all strategies for reducing emissions from port-related sources: ships, locomotives, trucks, cargo handling equipment and harbor craft. New in the 2017 Clean Air Action Plan (CAAP) Update are targets for reducing GHG emissions: 40 percent below 1990 levels by 2030 and 80 percent below 1990 levels by 2050. Strategies for reaching these targets include transitioning the on-road drayage fleet serving the Port to zero-emissions trucks by 2035 and all terminal equipment to zero emissions by 2030. Improving operational efficiencies, deploying advanced technology and managing energy resources are essential to this progress. Near-term measures for accelerating clean air progress include requiring all trucks entering Port service for the first time to meet 2014 model engine emissions standards. Technology advancements expected to further reduce emissions by improving the flow of cargo include the Port Optimizer™, which gives the supply chain a head start of about two weeks to plan operations and allocate resources for handling inbound cargo. To advance long-term goals, the port is working with private and public sector partners to test more zero emissions drayage trucks and demonstrate near-zero and zero emissions cargo handling equipment. The Port launched a number of projects before the 2017 CAAP Update was finalized.